Jennie painted it . . .
On Jennie’s first wedding anniversary she was faced with the temptation to eat her entire cake topper when an idea struck her. Looking at the wedding cake again she became aware of the metamorphosis the cake made in a year. From its ideal state on her wedding day to a less than perfect, eaten but still inviting cake on her first anniversary, the cake was a metaphor for her marriage. To explore this concept, Jennie brought the wedding cake metaphor to canvas in her Anniversary Stills. 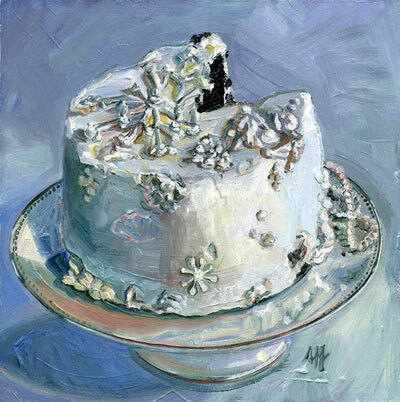 The topper of her cake sat in her refrigerator for a month or so after December 4, 2005, while she pulled it out daily to paint from it in her studio. The cake in the fridge became a topic of discussion in the family; everyone, including her husband, wondering when she might discard it. Six paintings later, she began noticing media attention about women seeking unique ways to preserve wedding memories and an interest in the paintings of her wedding cake. Putting two and two together, Jennie started seeking out clients and Wedding Cake Portraits came to fruition. Jennie is still happily married to her husband, Lee, of ten years, and enjoying painting, teaching art, and mothering her two young boys.